Rose Maybud (Aviella Trapido, center) has to choose between two suitors: shy Robin Oakapple (Mory Buckman, left) and salty Richard Dauntless (Jordan Zell, right) in Encore’s production of Gilbert & Sullivan’s opera, Ruddigore. Encore! 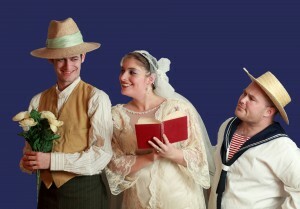 Educational Theatre Company presented Gilbert & Sullivan’s tenth collaboration, Ruddigore, or, The Witch’s Curse, at the Hirsch Theatre, Beit Shmuel, Jerusalem and Yad Labanim, Ra’anana on 28 December 2010-6 January 2011. The opera, written as a successor to The Mikado, is a hilarious pastiche on old-fashioned melodrama and was updated by Encore! to the silent film era of the 1920s. Staged by Robert Binder, with musical direction by Paul Salter and choreography by Arlene Chertoff.